ScreenSteps Workgroup supports the concept of concurrent licenses. Concurrent licenses enable you to purchase the number of licenses equal to the number of people you want working in your Workgroup library at the same time. Let's say you have five people in your company that will work on your documentation but you only ever need two authors to be working in ScreenSteps at the same time. In this situation you could purchase two concurrent licenses. 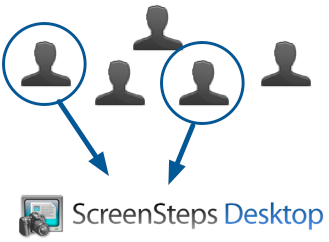 You could install ScreenSteps on as many systems on your network as you would like. But only two of the authors could have ScreenSteps open at the same time. If you need to increase the number of users who can use ScreenSteps at the same time you would just need to upgrade your Workgroup license. One thing to keep in mind is that an author must be able to connect to the Workgroup library in order to launch ScreenSteps. This means the author's computer must be on the same network as the Workgroup library to do any work at all, regardless of whether or not the author is working with the Workgroup library.